Some parents might consider this Waldorf themed birthing doll a little extreme, or perhaps even shocking, but kids do have a natural interest in birth and breastfeeding, and for open-minded or attachment parenting families, this Birthing Doll might just be an incredible learning experience. The 14″ tall birthing doll is handmade with natural cotton and wool, and is available in an array of hair, skin, and dress options. 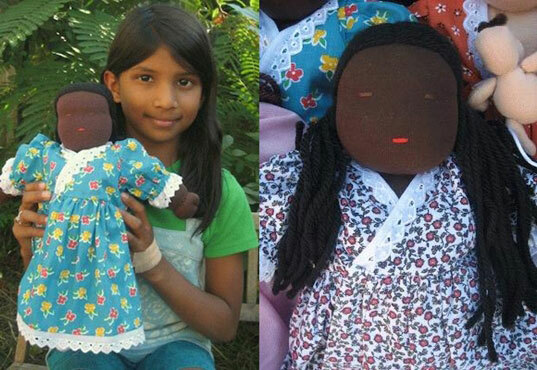 Each mama doll can give birth to a small cotton and wool baby doll. Each baby doll has an umbilical cord attached to a red felt circle, symbolic of the placenta, and the cord can be unsnapped from the baby’s stomach. The baby also has a little snapped mouth and can placed onto the mama’s breasts to nurse. In turn, the mama doll’s breasts have snaps as well, so that a secure breastfeeding latch can be accomplished. This would be the perfect gift for a new, older sibling, especially one who will be present at his baby sibling’s birth. You could even make this adorable DIY No-Sew Doll Carrier to go along with it. Personally, I think this is a great toy. First of all, it allows birth to be a normal idea for little ones. The births kids see on television are nowhere near normal. Secondly, kids are drawn to pretend play, especially when it closely mimics real life experiences. When my little siblings were born, I was hyper curious, and while my mom did get me my own “baby” doll to care for, it was not as sophisticated as this birthing doll. What do you think? Is the birthing doll too extreme, or a timely and educational pretend doll for little ones? Funny - my three yr old daughter was just asking me the other day for a 'mommy doll that has a baby in her tummy.' I found myself wondering if such a thing exists, or whether I could pull off making one myself. This is way too pricey for our budget, but nice to see it's out there. That's cool! I remember trying to nurse my dolls when I was four years old, right after my baby brother arrived. I would have loved this doll. BUT agreed that the price is a little steep. It's handmade though, and would make a great family heirloom, so there's those bonuses.